Actually, the concept of segment goes a little bit further. If the table is partitioned, then each partition is a different segment. 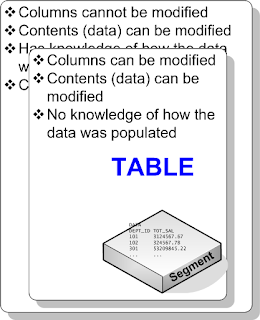 So, the relationship between tables and segments is one-to-many. 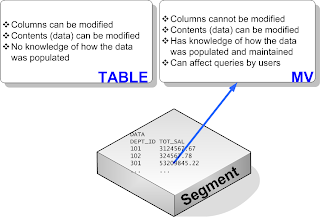 When you create an object that needs storage, such as a table, an MV or an index, Oracle first creates the corresponding segment. Once that is complete, the segment is shrouded by the cover of the object. The segment still continue to exist; but is now connected to the object. Until the segment is completely created and populated, the object technically does not exist. The segment may, in some cases, have a different name from the object. If the segment creation (or population) fails, Oracle automatically cleans up the remnants of the failed segment; but sometimes it may not be, leaving behind the chards that are eventually cleaned up by SMON process. Anyway, how is this discussion about segments relevant to our objective here –the fast alteration of MViews? However, the biggest difference is the very issue we are discussing – you can’t add/modify columns of an MV while you can do that freely for a table. If I could attempt to logically represent tables and MVs, here is how it would look like. The segment is the same. If it was created as an MV, the properties of MV take over the segment. If it was created as a table, the properties of a table take over the control. Even though there were two objects – a table and an MV, when you dropped the MV, both were dropped. The table object didn’t have an independent existence. Dropping the MV drops the table automatically. Now there will be two objects as well – one table and one MV. The MV simply took over the command over the segment but since the table already existed, it did not recreate the table object. So there are still only 2 objects. ORA-12083: must use DROP MATERIALIZED VIEW to drop "ARUP". "MV1"
Voila! The object still exists as a table. Previously you saw dropping the MV removed all the objects and the segment. However, in this approach the segment was preserved. Since it reverted to a table, you can do all things possible in a table – select from it, create index, and - most important – modify the column. You can alter the column to make NUMBER(11). That’s it. The MV is altered. The whole process took about a few seconds, and since you didn’t have to recreate the segment, you saved enormous load on the database. Here a schematic representation of what happened. Now you know how powerful prebuilt table option is. It only affects how you define the MV; nothing else. All other properties of the MV remain intact. The end users don’t even know about the prebuilt table option; but for the DBA it remains a powerful tool in the arsenal. As a best practice I recommend creating any MV, regardless of size, with the ON PREBUILT TABLE clause. In small tables you probably don’t see a huge advantage; but what if today’s small table grows to a large one tomorrow? It’s better to be safe than sorry. Now that you understand the power of the prebuilt option, you may be wondering how to convert the existing MVs to the new clause. Unfortunately there is no conversion path. You have to drop and recreate the MVs. That is why this time – when we are moving MVs to new tablespaces – we have the golden opportunity. 3. Spool this to a file to be executed later. 4. Edit this file to place ON PREBUILT TABLE CLAUSE. 5. Take a Data Pump export with CONTENTS=METADATA_ONLY option. This creates all relevant privileges on the export dump file. Keep it aside. 6. Drop the Materialized View MV1. 8. Execute the script you created earlier to recreate the MV. 9. Import the export dump file. It will recreate all the privileges. This is slow; but the best approach since it generates minimum amount of redo and undo. Hope this is helpful. You may look at an article I wrote http://www.dbazine.com/oracle/or-articles/nanda2 The article describes, with complete code, how to alter an MV where the refresh occurs across databases.